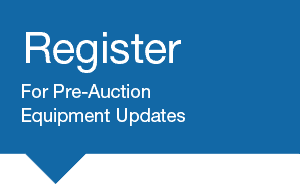 [July 2015] The level of communication throughout the auction process was impressive. Arlin and Frank made themselves available at all hours of the day and welcomed our questions, which gave us the confidence to know we were working with professionals that are committed to making trust paramount in their transactions. [July 2015] I have participated in both auction bids and post auction sales with Bajabid. In all cases I have been extremely satisfied with the accuracy of the product description, the fact the items functioned as they should and the ease of communication with Arlin and his team. We will continue to use Bajabid in the future for asset purchases. It continues to be a pleasure doing business with them. [July 2015] I have participated in multiple auctions with Baja Bid and each time it was a very good experience. The website is easy to use and the real time updates are great. The level of customer support surpasses other auction holders. Arlin and Jocelyn stay involved by following up with all parties to ensure post auction activities are being coordinated. My first experience I was able to speak to the seller directly on a high value item and get important info regarding it’s condition. The equipment I have purchased has met my expectations and makes me confident going into future auctions with Baja Bid. [May 2015] Arlin, I just wanted to reach out to you concerning this last equipment auction you handled. We received the equipment in and everything was just as you described. We appreciate the videos you took giving us confidence in the bidding and your assurances that the equipment would be in good working order. I am happy to say that is the case and my team will be placing business with you in the future as needs demand. I also want to thank you for going above and beyond on packing up the ups items and working with the freight company to get that picked up and over here. Once again we appreciate your outstanding dedication to your customers. Have a great day. [April 2015] Hello Arlin, Thank you very much for leading the sales of the assets of Creation Technologies in Lexington, Kentucky. Having you and your team onboard made the whole process that much easier, knowing that your full energies were galvanized into action and sales were being generated all the time. It was a new experience for us, and one where we learned a lot. What was particularly heartening was your fast adaptation to any challenge set before us, and the quick resolution put in place. No time wasted at all. So good luck in your future projects, we shall definitely be back. Thank you again! [April 2015] Dear Mr.Horsley, Thank you very much for your strong support to us for the recent purchase of the Panasonic SP 18 Screen Printer. You have strongly supported us throughout the deal from price negotiation until the machine shipment. We are very satisfied with this deal and rate your service highly. We are looking forward to do more business with you in the future. [January 2015] There are many organizations that claim to have their customers as their top priority but Baja Bid truly practices what it preaches. Excellent communication, expert knowledge and timely support are just a few traits the Baja Bid team have exhibited during our experiences with them. We look forward to using their asset management services in the future. 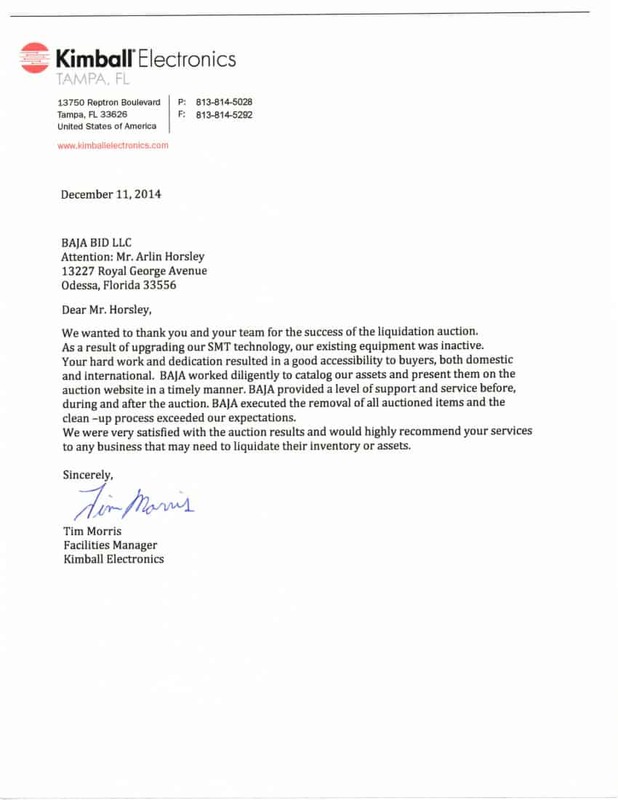 [January 2015] Our company has purchased and sold assets utilizing the services of Baja Bid. Their team has made the process for both services seamless and efficient. We would highly recommend their organization to anyone looking to buy or sell equipment especially in the electronics manufacturing and assembly industry. [December 2014] Mr. Horsley, I wanted to take a moment to thank you and your staff for all the hard work you put in your recent auction on our behalf. You not only sold all the equipment we had for sale, but also all of that of our client’s as well. Your attention to detail helped make our endeavor not only successful, but also a pleasure. We look forward to working with Baja Bid again very soon. [August 2014] I must admit I was skeptical at first buying equipment through an auction. My fears were laid to rest when you made everything easy. The communication and follow through were first rate. I bought a great piece of equipment for a great price and I am grateful. Baja Bid is a no brainier. I find it very rare to deal with a person as trustworthy as Arlin and I give him my highest recommendation. 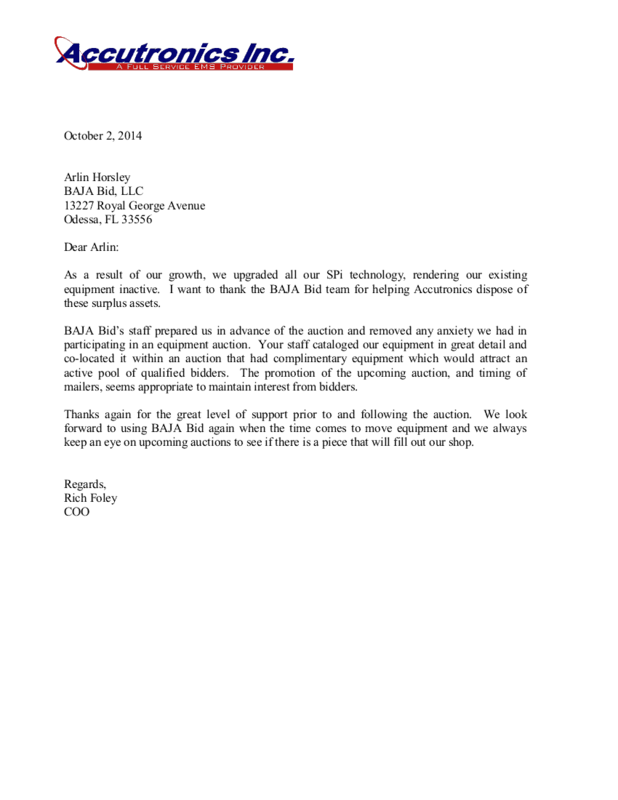 [August 2014] We have used Baja Bid both to purchase and sell SMT equipment. Arlin and his group have been very good to work with in these efforts. He has made this process very painless, and has gone out of his way to assist in equipment purchases even pointing us at other sources when he didn’t have exactly what we were looking for. I would not hesitate to recommend this company to anyone looking to buy or sell SMT equipment. 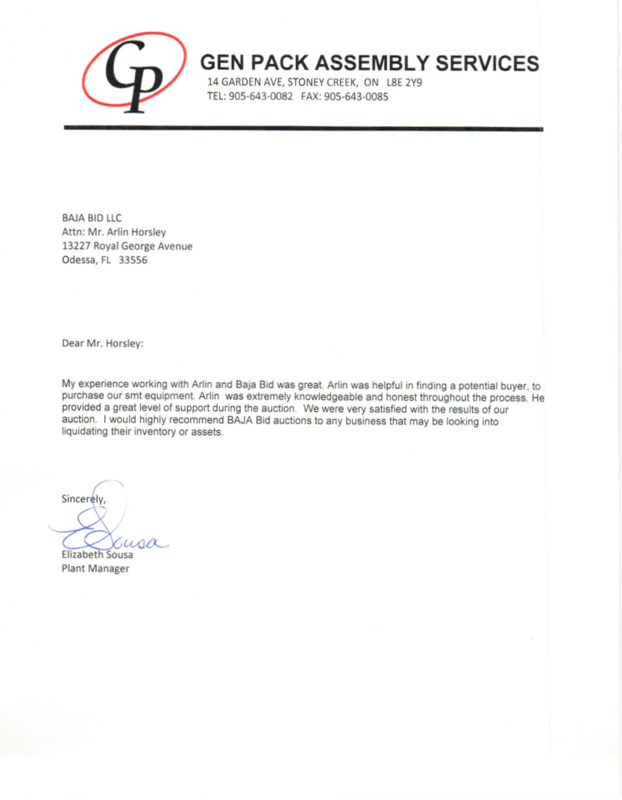 [June 2014] BAJABid has been awesome to work with! Arlin has gone out of his way to help my company with our needs and he even did it for free! His customer service and attention to detail are excellent. We have used his auction in the past with great success as well. I highly recommend BAJABid for your electronic needs! [May 2014] I participated in recent auction and purchased some items. I am very pleased with the entire experience. Representation of articles are accurate and bidding procedure is easy. Arlin is very helpful in every way. It’s a pleasure doing business with BAJAbid. [April 2014] There are many companies that offer auctions, there are a few that specialize in SMT auctions and there is only one that offers knowledge about the systems that are offered in the auction, and that is BAJA Bid. Specifically when buying overseas you need a company that you can trust. We being in Europe do not always fly into other continents to check the equipment before making an offer. With the professionalism that the BAJA Bid team offers, checking the equipment upfront, making video’s when necessary and supplying all information to make a good buying decision is key for us to buy on BAJA Bid. 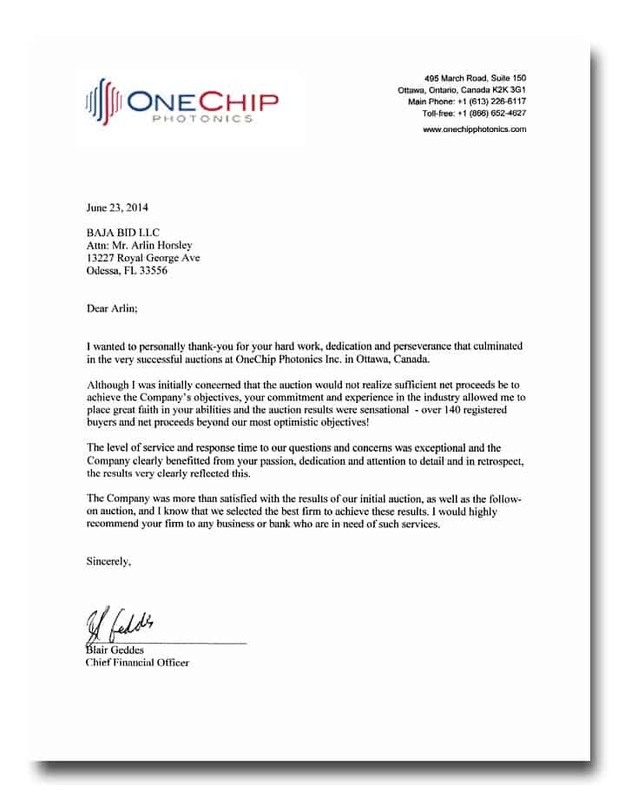 [April 2014] BajaBid took the stress and worry out of liquidating machines I no longer needed. BajaBid did in 3 weeks what I had been trying to do in 5 months. Very professional and definitely a service that I can use in the future! Arlin walked me thru every step of the process to make sure I understood what was going to happen and what to expect when the auction was in process. Thanks to BajaBid I can now move on with my business. [February 2014] I recently purchased a test system in the Baja Bid auction. Everything went smoothly from the inspection visit through the pick-up. Arlin’s industry experience and knowledge sets Baja Bid above many of the other auction companies. He knows the equipment, and knows the details that buyers are looking for. I would recommend using Baja Bid for buyers or sellers, especially with circuit board equipment. Thanks again. [January 2014] I want to thank the entire BAJA Bid team for their very good support during the complete period of time. BAJA Bid provided an excellent level of support before, during and after the auction. They helped us in every situation to solve any needs or problems very fast. It was very easy for us to create a schedule with BAJA that was possible for us to work off. 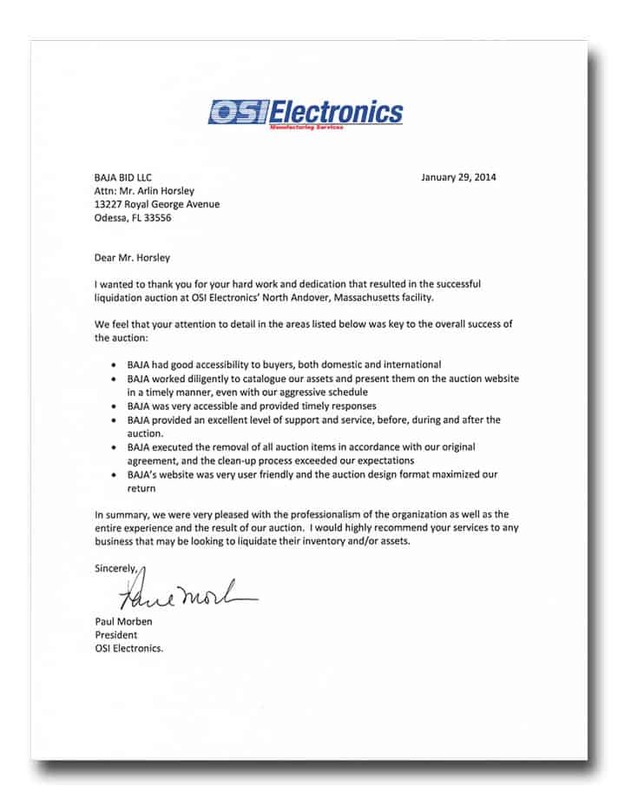 The email correspondence between BAJA and the seller was performed exemplary. The BAJA website is very user friendly and easy to understand. In summary, we were very satisfied with the result of the auction. I would recommend you and your service anytime and l’m looking forward to the next auction of BAJA Bid. [January 2014] My experience working with Arlin and Baja Bid was outstanding! 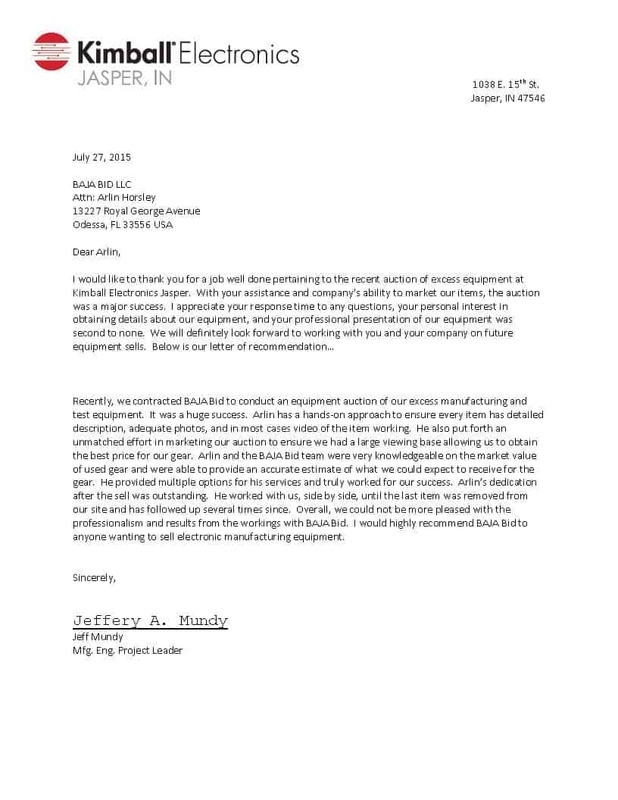 I originally contacted Arlin to see if he had interest in purchasing our company’s machinery and equipment. 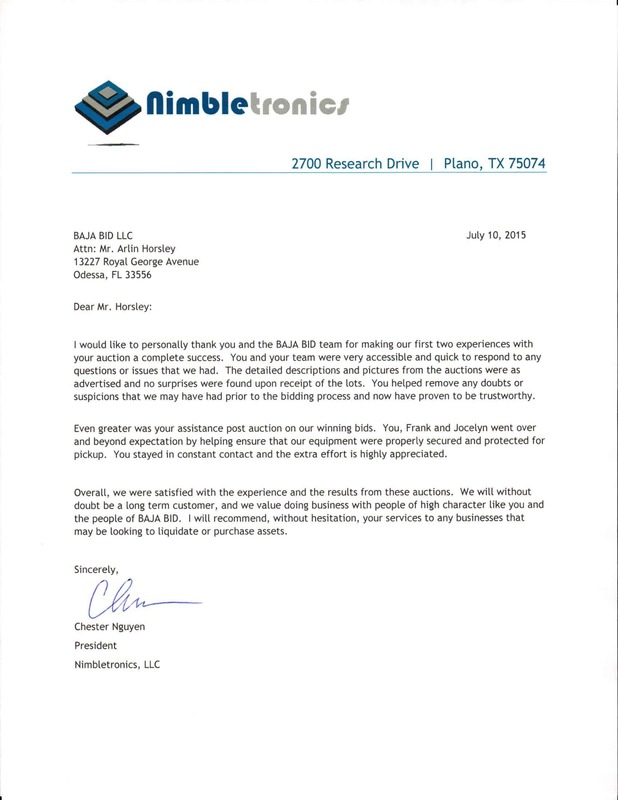 Although he did not purchase our equipment, he was helpful in finding a potential buyer. Arlin asked me for an inventory list of machinery, and went into each item to give me an idea of the estimated value. He followed up by asking what companies I had contacted, and went about contacting several potential buyers. He was extremely knowledgeable and honest throughout the process! I would highly recommend Baja Bid. 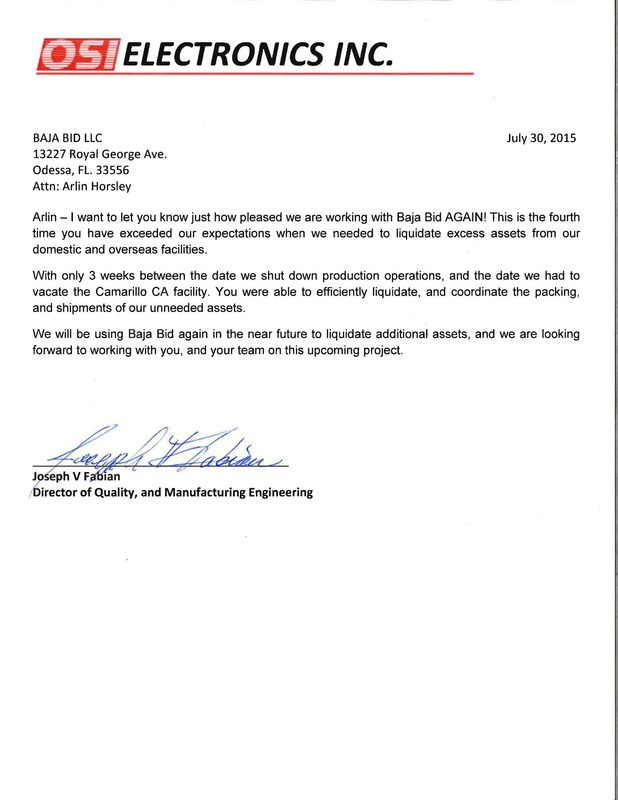 [January 2014] In December of 2013 we contracted with BAJA Bid to auction off a large amount of our equipment. From start to finish BAJA Bid provided us with excellent service. Their extensive advertisements, contacts, and hands on approach led to us maximizing the sale of our equipment under a very tight time frame. This was further enhanced by their ability to categorize and organize our equipment in a manner that led to very favorable selling conditions. I would highly recommend partnering with BAJA Bid for highly professional and effective equipment auctioning. [January 2014] Our company participated in your Dec 10-12 2013 auction and purchased several items. We were pleased with the entire experience. From the initial notice to navigating BAJA’s web site during the auction, and the arrangements for pickup, all went smooth. Representation of articles was accurate, availability of Jocelyn Long was never an issue, and pick up at North Andover, MA was accomplished without a hitch. Please inform us of future auctions. [January 2014] We recently took advantage of the equipment sale at OSI and I wanted to take this opportunity to thank you and the others at BAJA Bid for ensuring the process was organized and managed well. We are very satisfied with the equipment we purchased and the ease of negotiating for these items. Your staff was friendly, professional, knowledgeable and accommodating to our schedule. [November 2013] I wanted to take time to thank you for your assistance in my equipment needs. I enjoyed working with you. You were very accessible and provided timely responses. I felt that your knowledge, honesty and integrity reduced my stress, making this transaction go smoothly. I would be happy to recommend you and your company. I will be looking forward to our next transaction. [November 2013] To Whom it Concerns. Right from the get-go our experience with Arlin and his team at BAJA BID proved to be most beneficial. Their auction site provided clear and concise details. Bid feedback was instantaneous. And the BAJA BID team could not have been more helpful with pick-up and logistics which was a most refreshing post-auction experience for us! We look forward to working again with Arlin and his team. [November 2013] I’m very appreciated your services at Baja Bid. You and Jocelyn are very helpful. Your services are fast and very effective. After auctions, I got invoice within one day and I had picked up information very quick after I paid. It helped us a lot to pick up our equipments. I also appreciated the fact that even after we lost one of the bid, you still tried to help us to get equipment we needed. Your services are very importance to us, please keep doing the good work. [November 2013] We have used Baja Bid on several occasions. The communication level through the process is always fantastic. Their access to the buyer and seller community provides an excellent experience on both sides of the transaction. We will continue to take advantage of their great service and I highly recommend the team at Baja Bid for asset transactions. [October 2013] Arlin Horsley and his team at Baja Bid has done an excellent job at providing an auction site that is easy to use, with up-to-the-second action. The registration process was simple, and Arlin walked me through the entire process of bidding online using this website. The Baja Bid website is current, full of information and photos for each and every item being auctioned, and extremely user-friendly. I highly recommend Baja Bid’s services for any company looking to auction off their equipment. [October 2013] Dealing with Baja Bid has been a great experience. I am extremely pleased with the professionalism of the organization as well as the quality of the equipment matching the pictures and descriptions. I have no reservations in recommending Baja Bid as a valuable resource if you are looking for equipment. [October 2013] Your hard work and dedication ensured that we maximized the value of the assets we were selling. The number of buyers you accessed and the level of service you provided during the auction exceeded my expectations. Your follow through and professionalism made all the difference. I never had to follow up on the status of anything, and never had to question if you were going to do what you said you were going to do. Your process made my job easier! At this point Baja Bid is the only company that I would use or recommend to sell or market my assets. 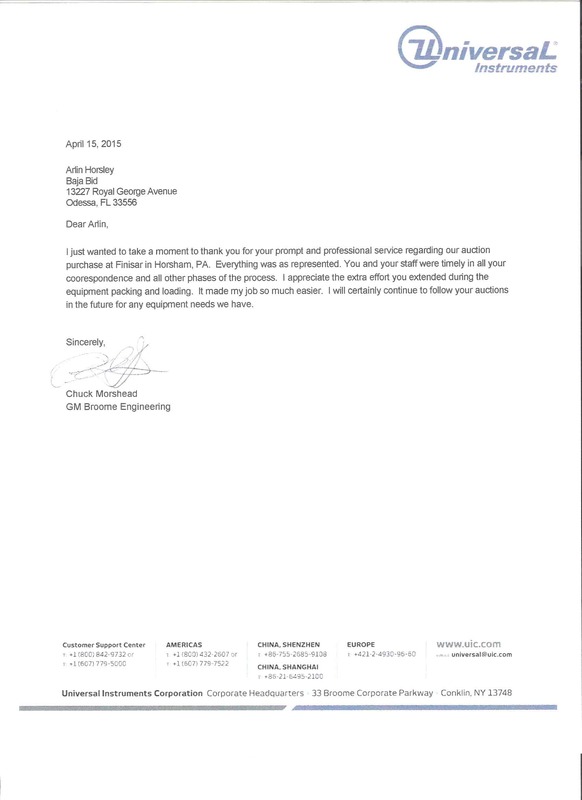 [October 2013] I just wanted to take this opportunity to thank you for the complete and upmost professionalism I experienced with your company recently. I found your site experience was seamless and made the experience pleasurable. The after sale experience was just as professional. This included everything from the financial transactions to assisting with logistics. We truly consider you a valued partner and will always return to your Company as a resource for our new business needs. [July 2013] Hi Arlin – I just wanted to take this opportunity to thank you for the complete and upmost professionalism I experienced with your company recently. Bidding on line auctions can be very challenging sometimes however I found your site experience was seamless and made the experience pleasurable. The after sale experience was just as professional. This included everything from the financial transactions to assisting with logistics. We truly consider you a valued partner and will always return to your Company as a resource for our new business needs. [May 2013] Arlin, Just a note to you and your organization. Our company had an excellent auction experience with Bajabid. Your team did a fantastic job with the whole process. Items were presented accurately, invoicing and payment were correct and easy. Also, you’re team went above and beyond with helping us with local riggers and transport. 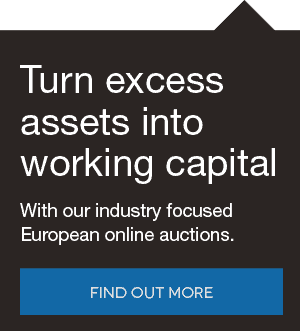 We look forward to your future auctions and continuing to work with you. Good Luck to you and many thanks. [May 2013] Participating in Baja Bid’s offering of assets for Diversified Technology was a straightforward process. Items offered were clearly presented with plenty of photographs, and navigating the lengthy list of assets was a snap. Upon close of the auction, the folks at Baja Bid quickly provided detailed instructions and forms necessary to complete the financial and shipping aspects of the transaction, and responded to questions in minutes, not days. Baja Bid’s professionalism, attentiveness to the customer and attention to detail made for an easy and stress-free experience. Highly recommended! [May 2013] Arlin and Jocelyn, I just wanted to inform you of what a seamless experience it was dealing with Baja Bid on the recent Diversified Tech auction. Your website was very informative with detailed descriptions and pictures. The site was also easy to navigate, easy to place bids on items and I loved the “outbid” e-mail notification feature. Your team was great to work with from the site password setup to packaging and invoicing. All our won items were delivered as described, labeled, and packed professionally. Throughout this whole experience, everyone on your staff was very helpful, provided information/feedback and was prompt with all e-mail responses. 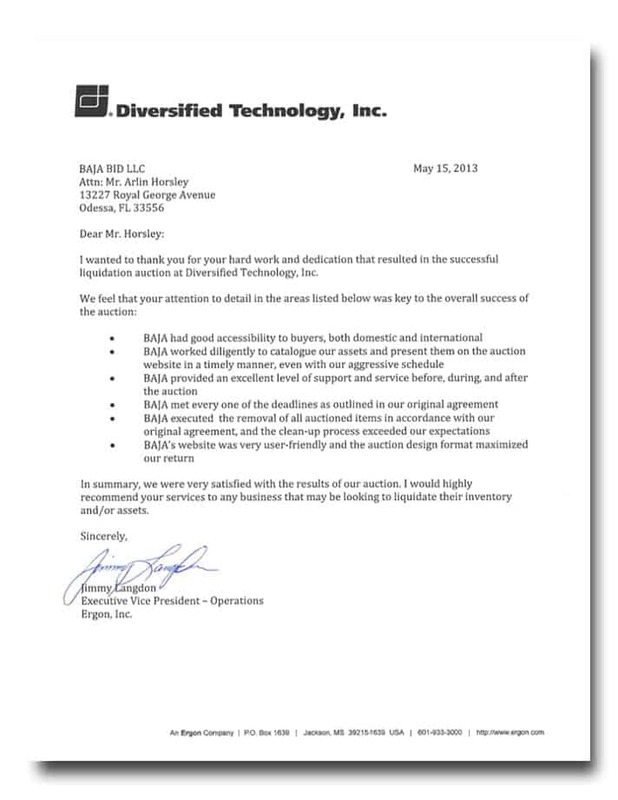 Baja also provided us with packaging and transportation referrals which was very helpful. Your team at Baja made this auction a very pleasurable experience and we look forward to working with you again. [May 2013] What I appreciate most from Baja Bid is their ability to accurately determine the quality and the condition of the equipment they are auctioning off. To me, it is the most important aspect when purchasing equipment from an auction, and Baja Bid provides better than all the others. [May 2013] I wanted to thank you and your staff for a great experience participating in the recent Diversified Electronics Auction. From the mechanics of bidding via your site , thru collection of our assets, your teams professionalism and attention to detail was nothing less than outstanding! I particularly was impressed with your staffs hands on approach, which made the whole buying experience, seamless. Our company will be watching for future auctions, and will be mentioning your company to industry contacts. [May 2013] I wanted to thank Arlin, Jocelyn and Al at Bajabid. I had purchased very sensitive test and measurement equipment from an online auction through Bajabid. My items were located over 1250 miles from my location. Thankfully, Arlin, was able to assist with professional packaging company ensuring that my purchase arrived in the same condition as they were shipped. It is very easy to click and bid, the difficulty is getting my items back at a cheap price, in a reasonable manner, packed better than many “professional” packaging companies.